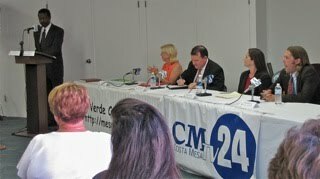 Review the Costa Mesa Candidate Forum held last Wednesday by viewing the streaming video, HERE. Watch the excellent presentation by CMTV on the recent Barrett-Jackson Auction, also on streaming video, HERE. 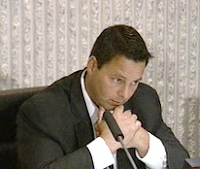 Watch the Costa Mesa City Council meeting from last Tuesday, the 17th, HERE. 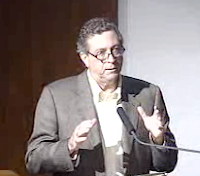 If you drag the scroll bar across to about the 03:40:00 point and watch the remainder you will get to see the petulance of Mayor Allan Mansoor as he, with his not-to-swift brain, tries to figure out the most politically expedient move to make when voting (or not voting) on the new youth soccer league in town. It's entertaining - pathetic, but entertaining. Or, you c an do as Katrina Foley says she's doing in a Daily Pilot article, and read through the 81 page draft ground lease for the Fairgrounds, looking for ways to make it more acceptable. You can read it HERE. 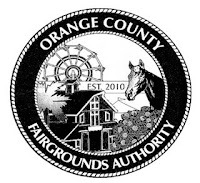 The council, as the Orange County Fairgrounds Authority, will be happy to hear your views and concerns at their meeting on Tuesday, August 24th at 5:30 p.m.
NAH - HAVE FUN, INSTEAD. Or, you can just blow all those things off and have a wonder, warm summer weekend here in this almost perfect little slice of heaven. Enjoy. Short ly after 6 p.m. Thursday the City of Costa Mesa posted on it's web site the draft Ground Lease between the Orange County Fairgrounds Authority (OFCA) and Facilities Management West (FMW). This document, all 81 pages of it, can be found HERE. The companion CEQA report can be found HERE. I'm not even going to begin to try to dissect these documents. It's a wise man who knows his limitations... I suspect that, as I type this, former Mayor Sandra Genis is fully immersed in that exercise in anticipation of making a presentation before the City Council/Authority Board at it's special meeting in council chambers on Tuesday, August 24th at 5:30 p.m. Make special note of the time - it's unusual for a meeting to begin at that time. For those of you with the skill set to analyze real estate documents, help yourselves. I hope you'll share your observations with us once you complete the task. WILL WE HAVE A DEAL OR NOT? Tuesda y's meeting should be interesting, to say the least. If the Authority Board does, in fact, end up with a completed document that night I'll be surprised. However, the guillotine blade is scheduled to drop on Friday, the 27th. On that date the legislators are scheduled to bail out of Sacramento and return to their home districts, returning after the November elections. If we don't get a document signed we have no chance of the legislature completing their part of this deal. Personally, I'm not holding my breath on this one. I fear I'd look like a smurf by next weekend. 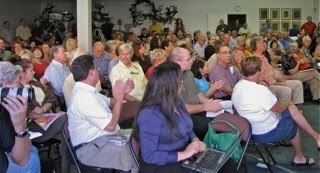 First, G ary Monahan informed audience that there will be a special joint meeting of the council and the Orange County Fairgrounds Authority again next Tuesday, August 24th at 5:30 p.m. at which the Ground Lease between the City and Facilities Management West would be presented and voted on. 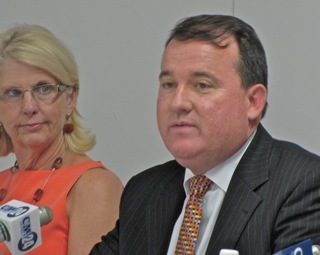 City Attorney Kim Barlow promised that the lease would be available for public review by the end of the day on Thursday, August 19th. 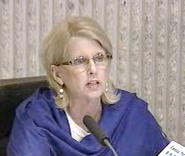 Former mayor Sandra Genis, President of the Orange County Fairgrounds Preservation Society, expressed concern that the public may not have enough time to sufficiently review the document before it's adopted, but it seems as though the lease will be available as quickly as is possible. Tuesday's meeting should be very interesting. Then Mayor Pro Tem Wendy Leece announced that she had appealed the lighting scheme for Triangle Square recently approved by the Planning Commission. That appeal will be heard at the first council meeting in September, on the 7th. Since that's the day following the Labor Day holiday weekend, we hope interested parties will come prepared with comments and factual data to refute the applicant's claim that there will be no spill-over into residential neighborhoods. Later Paul Freeman - a man I've identified in the past as a "silver-tongued orator", apparently showed up with some tarnish on that silver tongue. He was unable to convince the council that a 4-5 story assisted living/dementia care facility planned by his client at the site of the old Glabman's Furniture store a good idea. Beleaguered residents of the neighborhood that immediately abuts the site showed up and spoke with passion against the project. The most fun, though, was provided by Mayor Allan Mansoor, who demonstrated, from beginning to the end, that he is an unskilled politician who has developed pandering into an art form. First, he moved his proposal for a resolution naming June 19th each year as a day of remembrance for the Vietnamese soldiers who fought during the Vietnam War from the end of the meeting to the front of the line. Not only was he pandering with the resolution, but he expanded that pandering by not requiring the Vietnamese folks in the audience to wait in line for the issue to be addressed in turn. 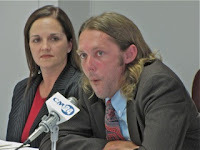 He was at his most animated as he presented the res olution and was very deferential to those Vietnamese folks in attendance who spoke on the issue. I suspect he was less than happy that Phu Nguyen, his opponent in the 68th Assembly race, was in the audience and, according to reports in the Daily Pilot, wound up in photos with Mansoor and the Vietnamese freedom fighters. As soon as the resolution was passed he immediately called a 10 minute recess and practically sprinted from the dais to rub shoulders with the Vietnamese folks in the audience. He may not be the sharpest knife in the drawer, but he knows he needs those votes in November. 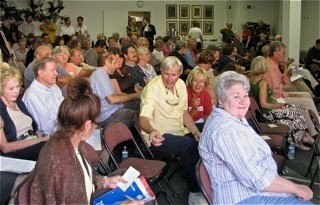 Then, at the end of the meeting, his old n emesis, Dr. Humberto Caspa, rose to speak in favor of providing a fee waiver for a new soccer group in town that would provide organized soccer for Westside Costa Mesa kids. So called "Group 1 Users" traditionally have the fees waived because they provide recreation activities for a high percentage of Costa Mesa kids. This program would use school fields at three schools deep in the heart of the Westside, where mostly Latino kids go to school. I knew this issue was in trouble with Mansoor because Caspa's recent book just shredded him - correctly so. At the end Mansoor demonstrated for everyone in the audience and watching at home just why Caspa wrote the book. Mansoor: Read the vote, please. Folcik: Uh, did you vote? Foley: You have to vote! Foley: Ms. Barlow, doesn't he have to vote? Mansoor: You've abstained from voting before. Foley: Only if I have a conflict. You have to vote! Mansoor: No, that's not true. You've abstained from the dais before. Foley: Only if I have a conflict. There's never been.. Check the record. I have never abstained without a conflict. Kim Barlow: Our code does require you to vote on any matters, unless you formally abstained. Foley: On what grounds? On what grounds are you abstaining? You don't want to have a vote before the record? What grounds? 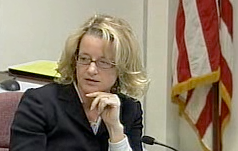 Foley: Ms. Barlow, honestly, this is un.., this is not appropriate for him not to vote. Barlow: Can I ask the council to go into a closed session. I need you to bring that item on the agenda to a closed session right now. Mansoor: Alright. We'll go to closed session. Barlow: I need a vote. I need a vote taken to go to closed session. Foley: Well, but she can't close the board. She needs to record the vote that was taken. Folcik: May I clear the board. Barlow: She can close the board and we can re-take the vote after closed session. Foley: But she needs to record for the minutes what happened here because otherwise it will not be reflected in the minutes. Foley: Can I have it read into the record, Ms. Folcik? Folcik: That motion failed 2-2 with Council member Bever and Council member Monahan voting no and Mayor Mansoor abstaining. Foley: Now we can clear the board for a motion to move into closed session. Barlow: Clear the board, please. Is there a second? To the motion to have a closed session? Bever: What are we having a closed session on? Mansoor: There's a motion and a second for a closed session. Call for the question. Folcik: That motion carried 3-2 with Mayor Mansoor and Council member Monahan voting no. They adjourned to a closed session for about 10 - 15 minutes. When they returned Mansoor was absent. Monahan moved to approve the request which Foley seconded. It passed, 3-1, with Bever voting no and Mansoor absent. 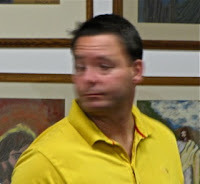 Foley asked why Mansoor was not there for the vote. Barlow said he "was unable to continue with the meeting". I had this vision of him pouting in a corner somewhere. I watc hed this train wreck and could find no reason for Mansoor to act so childishly, refusing to take a position on an issue that had been passed unanimously by the Parks & Recreation Commission EXCEPT that he just couldn't bring himself to vote in favor of ANYTHING that will provide ANY kind of benefit to the Latino children on the Westside. This soccer league was aimed directly at them. This clearly demonstrates how Mansoor lets his deep-seated prejudice against the Latinos of our community interfere with exercising good judgment while managing our city. We've observed this behavior for a decade, even before he was elected to the City Council. While no surprise, it always rocks me back because he's so flagrant about it. HOW WILL MINORITIES VIEW THIS MESS? And now, I find myself wondering how the Vietnamese and Latino voters in the 68th Assembly district will take this show of prejudice. 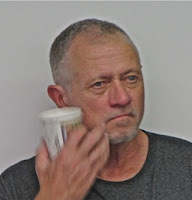 His bizarre behavior was the strangest of more than a few city council meetings I've observed in 10 years of paying attention. We certainly deserve better than this. You can watch the whole sordid display via streaming video HERE. Drag the scroll bar over to about 3:45:00 for all the fun. By the way, during the voting on the soccer issue Eric Bever reached around and pulled another stupid idea from some deep, dark place! He moved to deny the request for the fee waiver and, further, to yank all the fee waivers from all the Group 1 users! And who says we here in Costa Mesa don't have anything going for us. Heck, we not only have one village idiot, but two! 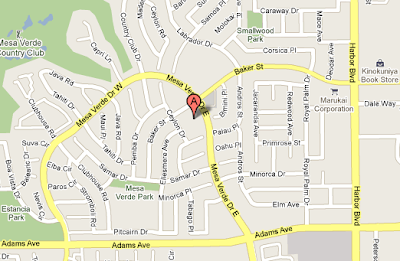 To night's Costa Mesa City Council meeting seems to be on the bland side based on the agenda available as I write this. One big item still missing is the staff report for Old Business #1, a discussion of budget adjustments for the Administrative Services group. City Manager Allan Roeder promised, in a placeholder memo, that the report would be available first thing Monday morning... it wasn't. UPDATE: The staff report is finally available and it sounds bleak. Recreation programs may take a major hit, including the Downtown Community Pool, city-sponsored Youth Sports Programs, ROCKS and Teens After-School Program and the Balearic Community Center. The council meeting begins at 6:00 p.m.
At the end of the open session, under New Business #4, is an item proposed by lame duck Mayor Allan Mansoor that is political pandering of the absolute worst kind. In his proposal he suggests a resolution, "recognizing a Day of Remembrance of June 19th for Overseas Vietnamese Veterans of the Republic of South Vietnam." Now, I have no problem at all recognizing the contributions and the terrible loss felt by the Vietnamese folks during the Vietnam War. (Some call it a conflict. With over 58,000 American dead, it was a war, period!) Millions of Vietnamese people lost their lives in the war. However, the fact that Mansoor's proposing this during a hotly-contested election campaign against Phu Nguyen for the 68th Assembly seat being vacated by Van Tran just reeks! I expect he will get unanimous approval from his colleagues on the dais. Some may recall that on June 16 , 2009, Mansoor proposed another resolution aimed directly at the Vietnamese people - a resolution recognizing the flag of the former Republic of Vietnam as the official flag of the Vietnamese people overseas. I'll post the other races in another entry later. 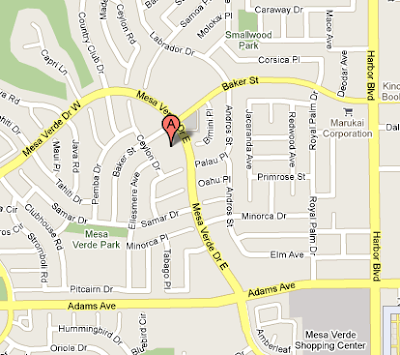 A reminder... Wednesday, August 18th, Mesa Verde Community, Inc. will be hosting the first city council candidate forum at 6:30 p.m. at the Mesa Verde United Methodist Church, 1701 W. Baker Street, Costa Mesa. Four of the five candidates will be in attendance - newcomer Chad Petschl will not attend. 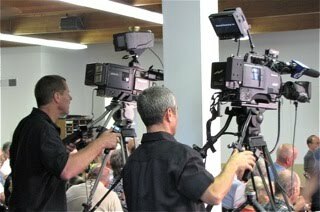 Costa Mesa TV will be there to tape it for future viewing. 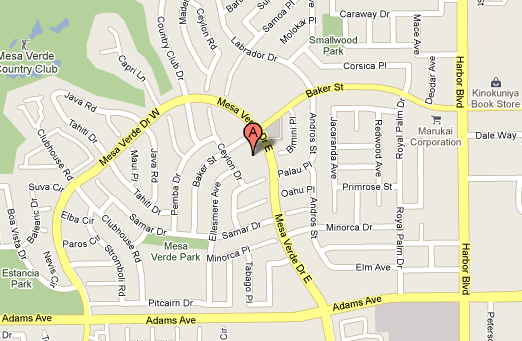 Again, here's the map to the location. The D aily Pilot had a cover story by Mike Reicher about lame duck Mayor Allan Mansoor Sunday that attempted to provide a brief history of the man and his mission. For those of us who have followed Mansoor throughout his career in Costa Mesa politics, most of it is old news, but there were some pearls to be gleaned. You can read Reicher's piece HERE. We knew that he sold his house for a big profit several years ago and that he moved into an apartment. What Reicher didn't tell us was that during that time Mansoor has consistently bemoaned the imbalance of renters vs. owners in our city, while he was contributing to that imbalance. DID HE RE-FI HIS PARENT'S HOME? Reicher did tell us tha t Mansoor bought his parents a home in Virginia. What he didn't say was that the bulk of Mansoor's campaign war chest is comprised of a $100,000 loan from a bank in Virginia. Did he re-finance his parent's home to finance his Assembly campaign? Or, did he re-fi it so he could live for a year during his campaign after leaving his job as a jailer for the Orange County Sheriff's Department the end of 2009? Reicher apparently didn't ask Mansoor why he left that job - did he quit or was he fired? Why would he quit when he had a year to go before he might have an Assembly job? How smart is that? I thought the quotation attributed to Eric Bever - who doesn't get it right very often - was the best comment in the article. Following a paragraph by Reicher that ended by stating, "Many, after knowing him for years, still can't tell you much about him — as a person. ", Bever is quoted as saying, "There's not a lot of personality there." Gee, no kidding, Eric! ENOUGH WHITE VOTES TO SWING IT? Citing Mansoor's difficulties in the current c ampaign, Reicher states, "Alienating ethnic groups, especially large voting blocks, is perhaps Mansoor's tallest election hurdle." Do you think? He's apparently doing virtually no campaigning in the Vietnamese community, which traditionally votes heavily Republican. This time they may feel our dullard of a mayor is not a good choice and vote for Phu Nguyen, a Democrat, instead. And, if we could figure a way to get the Latinos in Assembly District 68 to actually vote, Mansoor would be dead meat and he'd be looking for a job as a security guard at Target come January. In his article Reicher talks about how Mansoor alienated his fellow sheriffs to the extent that the Orange County Association of Deputy Sheriffs will probably not support him. I wonder how much of that has to do with his perceived lack of loyalty. You will recall that he rejected fellow Westside Improver and long time supporter Paul Bunney not once but three times when he was nominated for a planning commission slot back in 2007, following Mansoor's re-election. Instead, Mansoor lead the move to seat Republican activist, Dana Rohrabacher sidekick and recent Costa Mesa resident, carpetbagger Jim Righeimer instead. Apparently, for Mansoor, loyalty is an alien concept. Just ask Paul Bunney. 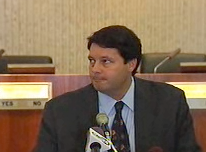 Reiche r also quotes Supervisor John Moorlach as questioning Mansoor's leadership, indicating that he has trouble being persuasive. Reicher quotes Moorlach as saying, "He can be stubborn. Sometimes that's an asset and sometimes that's a weakness." You're right, John... mules typically don't get elected to leadership positions. Wait a minute - maybe in this case they do - or did. Reicher states, "Besides his anti-illegal immigration and pension reform postures, Mansoor's agenda is rather non-descript." Boy, that's for sure... As councilwoman Katrina Foley says, "I'm not sure what else he stands for." DEVORE GETS IT WRONG - TWICE! 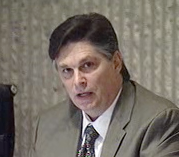 Rei cher quotes termed-out fellow-lame duck 70th District Assemblyman Chuck DeVore as saying about Mansoor, "He brings a very important nuts-and-bolts law enforcement perspective to the Senate." Well, first off, Mansoor's running for the Assembly, not the Senate. And, second, you gotta be kidding, Chuck! Mansoor spent virtually his entire law enforcement career dodging urine and feces as a jailer in the bowels of the Orange County Jail system. His time on patrol was no more than a burp after a burrito for lunch, for goodness sake. His "law enforcement perspective" is strange, indeed. 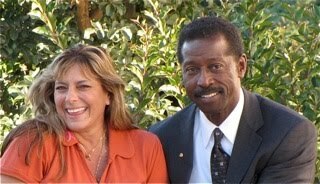 He has consistently ignored Costa Mesa's top cops when they've advised him on a variety of issues - letting his warped ideology get in the way of public safety and good law enforcement practices. A rookie Costa Mesa Police Officer knows more about real law enforcement than Mansoor does after a decade and a half as a Deputy Sheriff. Reicher closes his article by quoting Mansoor as saying, "I got into politics by accident..." To many of us who have observed him over the past almost eight years, that "accident" was a train wreck! With his record of inflexibility and his inability to negotiate and reach consensus, he will be a disaster in the Assembly. He will be a minority member - no small irony there, by the way - and, because of his "rule of law city" resolution, he will likely be assigned an office in the descending colon of the capitol, probably a broom closet in the basement with a 25 watt bulb. The residents and voters of the 68th Assembly District deserve better representation than that. Wil l someone please send Mansoor an application for that job at Target - he'll need all the lead time he can get.